Langar Hall is one of those places that seems miles away when you live in central Nottingham, I had always heard good things but not enough to make the 30min journey East of the city. The fate of judging the Nottingham Post Food and Drink Awards gave me an ideal opportunity. Despite my role I went undercover so my experience was not affected in any way. It is certainly a pretty location as you trundle toward the country house down a tree-lined single track road. They have the full gambit of expected offerings, rooms, afternoon tea and breakfast lunch & dinner. 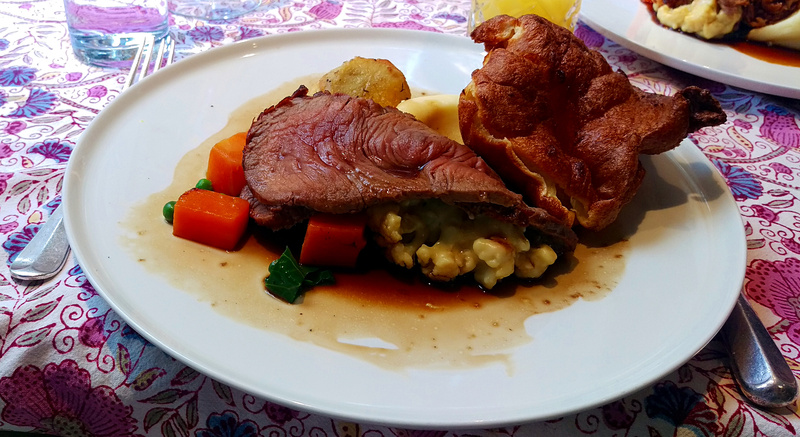 I visited for their Sunday lunch menu costing a fairly hefty £40 for 3 courses. There are a handful of rooms that comprise the dining area which mostly comprised of panelled walls and various objet d’art. Thankfully we were seated in the least chintzy room, a bright conservatory space with a Japanese influence. It was attractive but we were tucked out of the way a little which meant that service suffered. The majority of rest of the clientele were tie-wearing geriatrics. The sort who might have been our later in the afternoon for a shoot or an run around the estate in their classic car of choice. After a pre-lunch drink, from a strong menu of options, we chose our first 2 courses. The list of starters was almost exactly what you might expect, the likes of soup and chicken liver parfait a staple of the high end lunch menu. There were some more interesting options though, twice baked cheese soufflé a popular choice judging by those around us. I couldn’t find anything that took my fancy so asked if I could have the main course risotto as a starter portion. They willingly obliged and the pea, asparagus, wild garlic, goats cheese and tomato number looked as good as any bowl of rice can I suppose. It was summery and I enjoyed the seasonal vegetables though the feta was quite dominating as some big chunks of it were served. You don’t want to mess around too much with the main course of a Sunday lunch. I dispense with the call for something exciting and innovative, just give me good roast beef. It wasn’t particularly pretty, yes the thick slice of beef was inviting but the thin gravy had spread unattractively across the plate. Whilst ok I didn’t think the meat was of the highest quality was a little overcooked to my taste. It was less cooked in the middle but that showed the lack of sophistication in cooking. Perhaps the aforementioned demographic meant they catered for the palate of the older generation, some elements were over seasoned and the carrots in particular were incredibly salty. Everything else was on surer footing, I am happy with anywhere that includes cauliflower cheese amongst the trimmings of a roast. The gravy at least looked better than appearances suggest but it was still lacking flavour and thickness to really bring everything together. 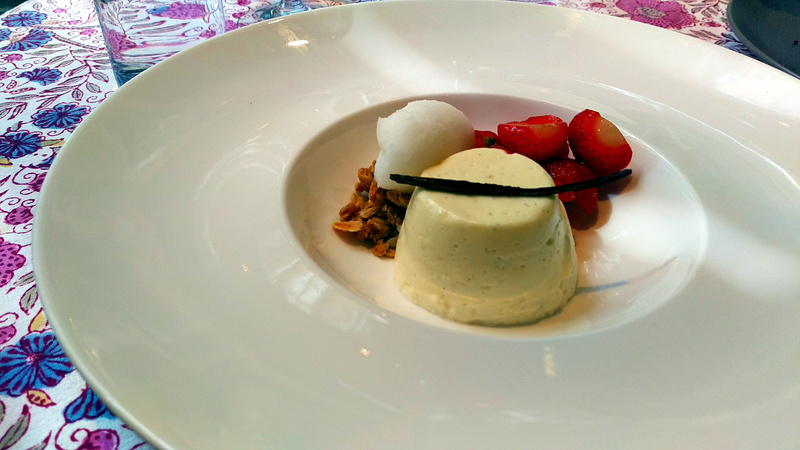 I like a panna cotta and thought it was the sternest test of the kitchen’s technical ability amongst the desserts. It wasn’t a masterclass from the pastry section, the main two items didn’t have the right consistency. The elderflower sorbet was a bit more like a granita, not smooth but chunky with larger ice crystals. The panna cotta itself somehow had air bubbles in it and lacked that thick wobble that is so pleasing. Despite these flaws it was still enjoyable, the flavours of strawberry and elderflower and certainly classic and worked well together with the light custard. The little things you expect at this sort of restaurant, spending this sort of money, didn’t happen. A large proportion of the staff were very youthful and whilst there were no disasters they certainly could have been more polish in the service. The overall experience was disappointing given Langar Hall’s reputation, in particular the expense stood out. At £40 I struggle to think of anywhere locally where you would pay this much for Sunday lunch. Lunch at the Mandarin Oriental, Heston Blumenthal’s London restaurant will cost me £45 and if that is the pricepoint Langar are competing at then they fall far short. A couple of weeks later I had Hart’s equivalent Sunday menu and had a much superior main course, spending £25 on 3 courses. I understand that it appeals to its regular customers over the years but there is work to do to appeal to a younger foodie like me.